But yes; Chamorros served in the military during the American Civil War (1861 to 1865). But if you remember that young Chamorro men were leaving Guam as early as the 1820s to sail as crew members on the whaling ships, many (if not most) of them never returning home, it begins to make sense. The whaling capital of the United States in the early 1800s was New England, the northeastern corner of the country including Massachusetts and the neighboring states. Some Chamorro whaling men took up residence in New England and other Chamorro whaling men would happen to be there for a time, waiting for the next whaling expedition. So, when the Civil War broke out in 1861 and soldiers were needed, there were Chamorro whaling men living on the East Coast who joined the Union forces. Many times these Chamorro recruits were substituting for Americans who wanted to avoid going to war. These Americans would pay their substitutes a handsome fee. Researchers have come across some records, but not necessarily all records. When new records are found and looked through, we might find new names of recruits from the Marianas. One thing that makes it a challenge to identify Chamorros in these records is that they sometimes did not say they were from the Marianas (or Ladrones). They sometimes said they were from Spain, since the Marianas were under Spain. A smaller number of people would say they were from the Philippines, since the Marianas were a part of the Philippines while both were under Spain in the 1800s. Thus, a record could show that a person was from "Spain," when, in fact, it is a Chamorro from the Marianas. Since many Chamorros have Spanish surnames, it's hard to tell if a man listed as being from Spain is actually a Spaniard or a Chamorro with a Spanish name. Since many Filipinos also have Spanish surnames, that makes it all the harder to tell. If a man named Taitano (or another indigenous Chamorro name) is listed as being from Spain or the Philippines, we can be almost certain he is actually a Chamorro who comes from the Marianas which were under Spain (and a province of the Philippines when it was under Spain). The names included here all joined the US Navy. This should not be a surprise since almost every Chamorro recruit got to the US in the first place as crew members on the whaling ships. Life on the sea is what they knew. All of these Chamorro recruits enlisted in the Navy at American seaport towns or cities. Again, that's where we could expect lifelong seamen to take up residence. The greatest number signed up in New Bedford, Massachusetts (the whaling capital of the US) with a few joining in Boston. One enlisted in Philadelphia, Pennsylvania and another in Hoboken, New Jersey. Since these Chamorro recruits were signing up in the American northeast, they all served in the naval forces of the Union. There may have been a small number of Chamorros who ended up in the South and could have joined the Confederate forces, but until we find documents and records we can't say for now. Except for a few, most of these recruits identified as natives of Guam or the Ladrones (Marianas) have names that don't resemble any Chamorro family names we know of. Some have English names like Brown, Ogden and Rogers. This was because some Chamorro men wanted to avoid the problems that came with having a strange name in their new home. By adopting an English name, rather than keeping Pangelinan or Chargualaf, for example, they could avoid the strange reaction of Americans when they asked their names, and the interminable question how to spell it, when many a Chamorro seaman didn't know the answer himself. This is also why most of them switched to the English form of their given names. Juan became John; José became Joseph. Sometimes they kept their Chamorro surnames, but changed them a little to sound more English. A man whose last name was Nicholas could easily have been a San Nicolás, and someone named de la Cruz could simplify it and fit right in by calling himself Cross. Spelling, also, was not consistent. In the list there is both a Peres and a Pérez. Both names would have been pronounced the same way by a Chamorro in those days. John Flores, 16 - the youngest so far! Bernard Punzalan at chamorroroots.com came across a Peter Santos from Guam who, unlike everyone else who joined the Navy, enlisted in the US Army. He, too, was a substitute for another man. Did any other Chamorros join the US Army besides Peter Santos? Did any Chamorro soldier or seaman die in battle in the Civil War? 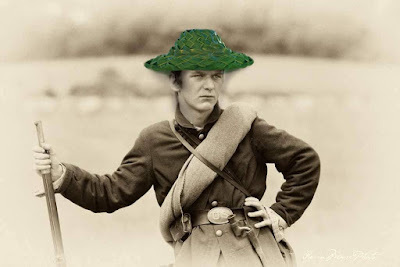 Did any Chamorro serve in the Confederate forces? Pale Eric, I recently came across an article on line that identifies some folks who I know their family members here in Edgewood, Maryland - they had joined the Union Army as well. Rosario family through Bruno Rosario (bn abt 1860) and of his wife Juliana Rosario Benavente (bn abt 1852), maybe a connection with either Bruno or Juliana with Benjamin Rosario (bn abt 1838) who was the eldest (24 years old) of the three from Guam whom enlisted in 1862. Haha yes almost all the Chamorros listed on all the recruitment lists describe them as "copper tone." Those 3 additional names you have provided joined the US Navy, though; not Army. Thank you for sending me this additional information! Bruno del Rosario, and his wife Juliana, were the paternal great grandparents of my husband John Babauta Rosario. Pale Eric. A Mr. Larry Cruz from NOCVA headquartered in Maryland knows a Mr. Cruz from New Hampshire, who is a white man of Chamorro descent. I believe Mr. Cruz is a great great grand son of a Chamorro who became a whaler and ended up in New England, FYI. If Larry or Mr Cruz can send the oldest info they have on his ancestor, we can maybe do some more research and find out more. I wondered about the name Benjamin Button. In Beyond Distances, Madrid identifies a John Button as the captain of the Joaquina Ana, owned by Joaquin Portusach. So perhaps there was a family with that surname in Guam!